Former Vice President and chieftain of the All Progressives Congress (APC), Atiku Abubakar, congratulates Nigerians on the occasion of the nation’s 55th independence anniversary. In a statement released by his Media Office in Abuja on Tuesday, 29 September, the former Vice President says "Nigerians deserve a pat on the back for their success and perseverance in preserving the country since independence despite the stresses and strains of nationhood". The Turaki Adamawa reminds Nigerians that this year’s celebration is significant because it coincides with a rare change of government when an opposition party took over power through a democratic, free and fair election. 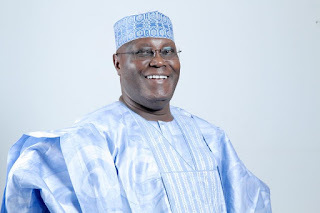 Having succeeded in deepening our democracy by making possible a peaceful transfer of power from one political party to another, says Atiku, the task before the people now is to work for national unity and peace in the land to lay the foundation for nation-building. The former Vice President identifies nation-building as the greatest challenge facing the country at this present time because Nigerians still need to improve the way they relate to one another, adding that there is the urgent need for the people to begin to see themselves first as Nigerians, rather than one ethnic group or the other. Stating that the future of the country lies in its ability to achieve unity and peace, the Turaki Adamawa urges all those in leadership positions to show good example to their followers. He opines that unity and peace would be much easier to attain if leaders at all levels allow justice and fair play to govern their actions. He states that when people believe in the fairness of their leaders, they would be ready to do everything within their power to protect their fatherland. Recalling the challenge posed to the wellbeing of the nation by the prolonged Boko Haram insurgency, the former Vice President is full of praise for the resolve of the nation’s Armed Forces and the successes of the latter in the campaign against terrorism. He calls on Nigerians to continue to support the Armed Forces and its Commander-in-chief, President Muhammadu Buhari, until terrorism and the destruction and violence it brought, becomes a thing of the past. Atiku Abubakar urges all Nigerians to support the government at all levels noting that as a watershed year in the fight against terrorism, the attention of the nation would now focus on reconstruction and rehabilitation of the areas devastated by the insurgents as well as provision of critical socio-economic infrastructure in other parts of the country for development purposes. The former Vice President while maintaining that the future of the country is bright in view of anticipated changes in all aspects of the life of the nation, appeals to groups that are aggrieved in one way or the other and espousing separatist sentiments, to drop their agitation and take advantage of the improving political climate in the country, to seek accommodation in the larger united national community that is fast unfolding.